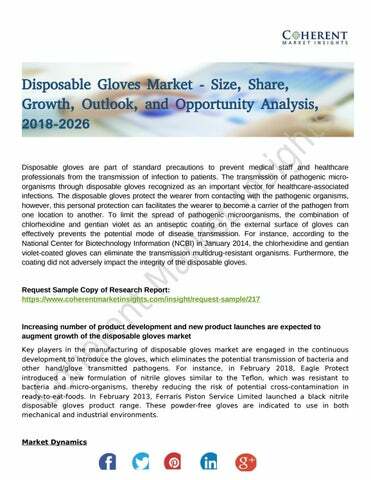 Disposable Gloves Market - Size, Share, Growth, Outlook, and Opportunity Analysis, 2018-2026 Disposable gloves are part of standard precautions to prevent medical staff and healthcare professionals from the transmission of infection to patients. The transmission of pathogenic microorganisms through disposable gloves recognized as an important vector for healthcare-associated infections. The disposable gloves protect the wearer from contacting with the pathogenic organisms, however, this personal protection can facilitates the wearer to become a carrier of the pathogen from one location to another. To limit the spread of pathogenic microorganisms, the combination of chlorhexidine and gentian violet as an antiseptic coating on the external surface of gloves can effectively prevents the potential mode of disease transmission. For instance, according to the National Center for Biotechnology Information (NCBI) in January 2014, the chlorhexidine and gentian violet-coated gloves can eliminate the transmission multidrug-resistant organisms. Furthermore, the coating did not adversely impact the integrity of the disposable gloves. Increasing number of product development and new product launches are expected to augment growth of the disposable gloves market Key players in the manufacturing of disposable gloves market are engaged in the continuous development to introduce the gloves, which eliminates the potential transmission of bacteria and other hand/glove transmitted pathogens. For instance, in February 2018, Eagle Protect introduced a new formulation of nitrile gloves similar to the Tefon, which was resistant to bacteria and micro-organisms, thereby reducing the risk of potential cross-contamination in ready-to-eat-foods. In February 2013, Ferraris Piston Service Limited launched a black nitrile disposable gloves product range. These powder-free gloves are indicated to use in both mechanical and industrial environments. Increasing awareness regarding hygiene among healthcare service providers and food service industry is fueling growth of disposable gloves market. For instance, in December 2016, U.S. Food and Drug Administration (FDA), banned the powdered surgeon gloves, powdered patient examination gloves, and absorbable powder gloves, as they cause the substantial risk of illness or injury to the healthcare professionals and care givers. In November 2016, the Nestle India, Food and Drugs Administration, Goa and National Association of Street Food Vendors of India (NASVI), trained around 500 street vendors. The training of street vendors conducted by NASVI includes the efectiveness and application of disposable gloves in health, hygiene, food handling and proper waste disposal operations. According to the Malaysian Rubber Gloves Manufacturers Association (MARGMA): January 2017 fndings, the demand for healthcare gloves are growing to increase by 8-10% in 2017, moreover the demand for nitrile gloves is expected to exceed over the latex gloves in coming years. Semperit AG Holding, Shield Scientific B.V., Supermax Corporation Berhad, and Top Glove Corporation Bhd. Medical gloves are disposable gloves used during medical procedures, such as diagnosis, surgery and handling of chemotherapy agents.